I have been thinking of getting this symbol as a tattoo too. Did you go through with it? but a little more ornate and between my shoulder blades. I can’t exactly explain why it speaks to me so strongly, but it is very symbolic in a way I can’t quite find the words to describe. It evokes an eternal sort of feeling. I don’t know. The main thing holding me back is that other people might think it’s stupid but when I actually say that it doesn’t seem like it should matter. 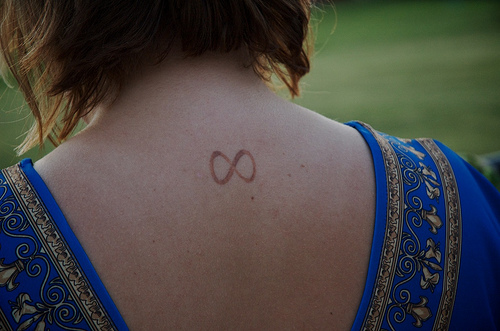 If you’re still unsure, try getting a henna of it! See if you love it on you. At the end of the day, it’s just a little picture on your skin, and clearly yours isn’t trashy, scary, or really…out there. If it means a lot to you, and has for awhile, then go for it!